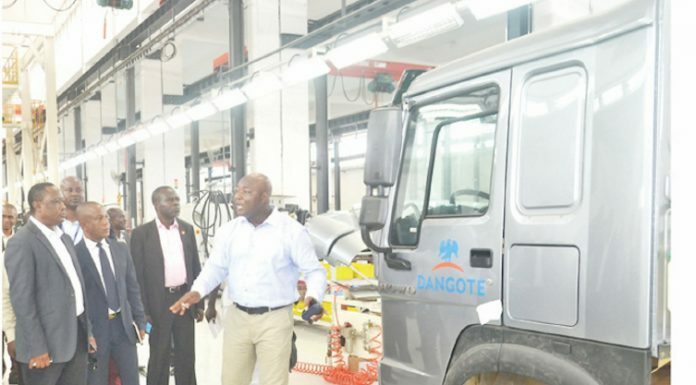 The Dangote Sinotruk West Africa Limited recently disclosed plan to increase its input into the assembling plant to up to 60 per cent, even as it plans to roll out commercial vehicles soon. The expansion drive, which was part of the backward integration plan, was meant to enhance value addition and local content. Group General Manager of the Company, Hikmat Thapa, made this known during a facility tour of the Ikeja plant by the Lagos State Commissioner of Commerce, Industry and Cooperatives, Mrs. Olayinka Oladunjoye. He said having done with the phase one of the project, the company had embarked on the phase two which has to do with adding of the facility for cab welding, painting& trimming. Thapa, stated that the third phase of the project expansion would be to add the facility that would be used to fabricate, paint & assemble different type of Trailer bodies, load bodies with dual & triple axles, Tipper bodies & tankers and so on. He explained that Dangote Sinotruck has installed capacity to assemble and produce 15 â€“16 trucks per shift or 10,000 trucks annually and will create over 3,000 different jobs across Nigeria. â€œThe company has the plan to have welding & painting shops to fabricate& paint truck cabin & Trailers of different type so as to enhance local content of Completely Knocked Down (CKD) operation of commercial vehicle manufacturing. â€œIn next one year, we have on our agenda to assemble and fabricate Truck Cabins, different type of trailers, Tipper bodies and Tankers etc. in our plant to increase value additions up 40 â€“ 60 %,â€ he added. Oladunjoye was optimistic that with the level at which the company was going, it would soon be a matter of time when Nigerians would opportunity for cheap vehicles. He enjoined other businesses to emulate Alhaji Dangote in the efforts to create jobs through manufacturing rather than importation of finished products. She promised to relay the message of what she saw back to the state governor. The company was established to assemble and produce full range of commercial vehicles covering heavy duty truck, medium truck, light truck and other semi-trailers etc. It aims to meet an expected current demand of the segment of Automobiles required for logistics, construction, food & beverage industries in Nigeria to support the governmentâ€™s efforts on boosting the economic development across the country.